It really did. Now, I'm not one who came out instantly jaded from the get-go like so many others. 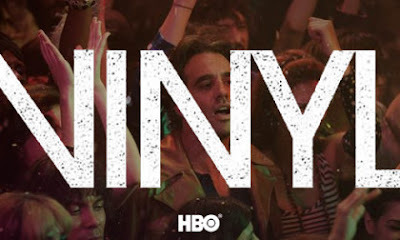 I'm totally 100% fine with another Terrence Winter HBO project set up by Martin Scorsese, and this time starring Bobby Cannavale, the guy who played the best Boardwalk Empire foil of them all, as record label head Richie Finestra. Mix in lots of cocaine and booze and and all the dirty glamour, and sounds, of the various music happenings of the early '70s, and you really just have me. The first few episodes didn't move well, though, despite the Scorsese touch of the two-hour Pilot. (That nutcase sequence of the building crashing down over the New York Dolls will go down as one of my favorite TV moments of the last several years at least.) The energy seemed tamped down at times by the heaviness of the Richie character's immediate downward spiral. But the music has been there, brilliantly sprinkled throughout in the form of live reenactments both on physical stages and as these sort of expressionistically stagy interludes. Of course, there is also plenty of soundtrack greatness underlining about every scene. The latest episode, an inside the "hustle" of signing and keeping talent on the label called "The Racket," offered the most Scorsese-esque rhythm of the season so far. This thing moves in that way I've been looking for. Richie's marital troubles with wife Devon (Olivia Wilde) continue to rise all the way to the divorce lawyer. Meanwhile, at the American Century offices three meetings become four, when, at a breakneck but silky smooth pace, Richie's old friend, now foe, Lester Grimes (Ato Essandoh), reaches the office at the same time as the funk act, Hannibal (Daniel J. Watts), the company's golden ticket at this point, a Sly Stone sort of character, and the Nasty Bits (led by James Jagger), a raw early punk band waits to be signed for the first time. Oh, and Robert Goulet is in the studio doing a Christmas album. Oh, yeah! Richie gets coked up, pisses everyone off in one way or another, then there's this scene that straight got me pumped, as if I wasn't already. Simply, it amounts to fire and Janis Joplin doing "Cry Baby" in an angry fever dream. The flash this series promised is finally here, and it is all in the camera movement and editing, highlighted by the best compilation of tunes on a single episode yet this season. Here's a little taste of what you'll hear. I mean that needle drops, ya dig? Why aren't you watching this show? It's actually on HBO, but I don't pay for it. We borrow my sister-in-law's password once a week. She's cool with it. I've been enjoying Vinyl. I thought the two hour premiere was a bad idea. It was very slow, some shows just aren't meant to be binged like that. It's been improving ever since though. So brilliantly shot and acted. I love Bobby Cannavalle. Like you said, he was my favorite baddie in Boardwalk Empire as well. I'm glad they gave him an Emmy for it. It was slow, but that New York Dolls scene was so amazing! Cannavale so deserved that Emmy. One of the best villains ever. This looks SO GOOD! I didn't read anything past your spoiler mention, but I really want to see this. UGH...I also really want to watch Boardwalk Empire! It really is. I hope you catch up with it, man, and let me know when you do. And Boardwalk Empire is incredible. I couldnt agree with you more. I was a big fan of Boardwalk Empire and when I heard that Winter and Scorsese were collaborating with Mick Jagger, I was really excited. And boy did this show deliver. Hope it stays this entertaining. One thing I can be sure of, is that the soundtrack will stay fantastic throughout. And Bobby Cannavale is so good in this. I'm so glad he got such a good role because I've always been waiting for him to branch out from those supporting roles (not that they were a bad thing). His performance as Gyp Rosetti was by far my favorite thing of the entire series.